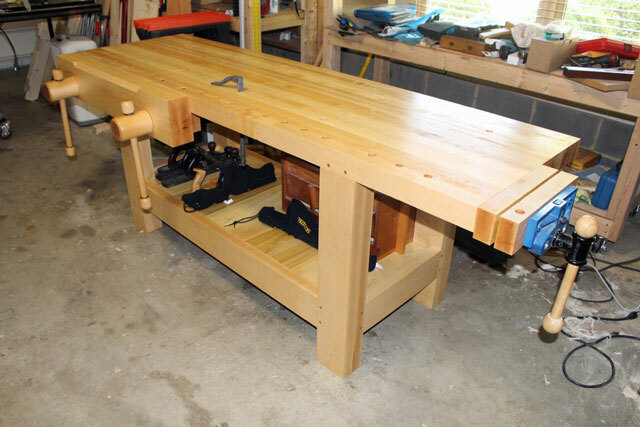 Our July 2015 Workbench of the Month comes to us from Scott F. from Yorktown, Virginia. 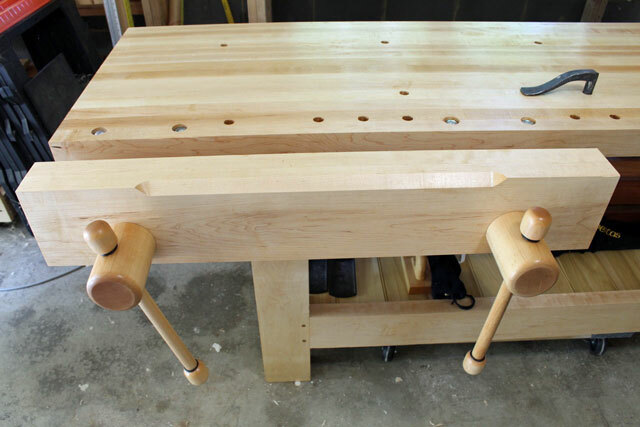 Scott has built a tremendous Holtzapffel workbench as mentioned in Christopher Schwarz’s definitive “The Workbench Design Book” in which he modified it to meet his needs by making the bench top a bit longer and a bit thinner. 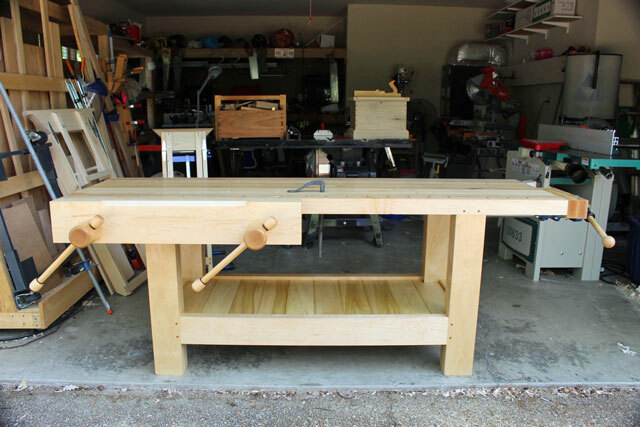 The end product – one amazing workbench! Hello, I am Scott F., and I am an amateur woodworker. I would like to submit my workbench that I built using a Lake Erie Toolworks Wood Vise Screw kit into the Workbench of the Month Contest. I built a modified Holtzapffel Workbench as mentioned in “The Workbench Design Book” by Christopher Schwarz. It is built with hard maple for all parts except the shelves and dowels. The Holtzapffel typically is 6 feet long with a three inch top. I modified mine to be 7 feet long, 31.5 inches tall, with a 2.5 inch thick top. I decided to slim the top down to 2.5 inches to keep the weight down enough to be manageable for solo construction. Considering the average density of hard maple – it weights just as much as the original 3 inch thick top x 6 feet long. 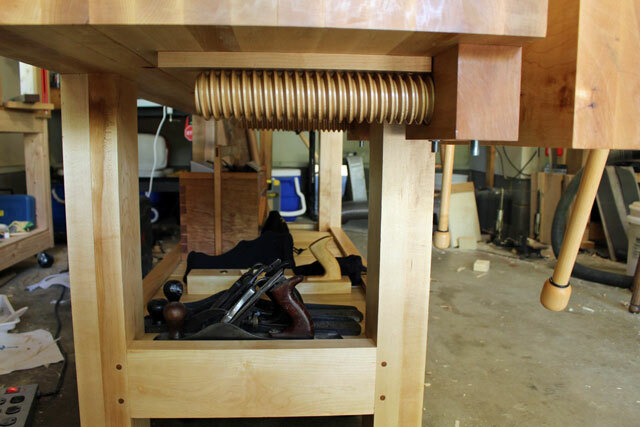 The legs and top are connected with mortise and tenon joints that are pegged with white oak dowels. 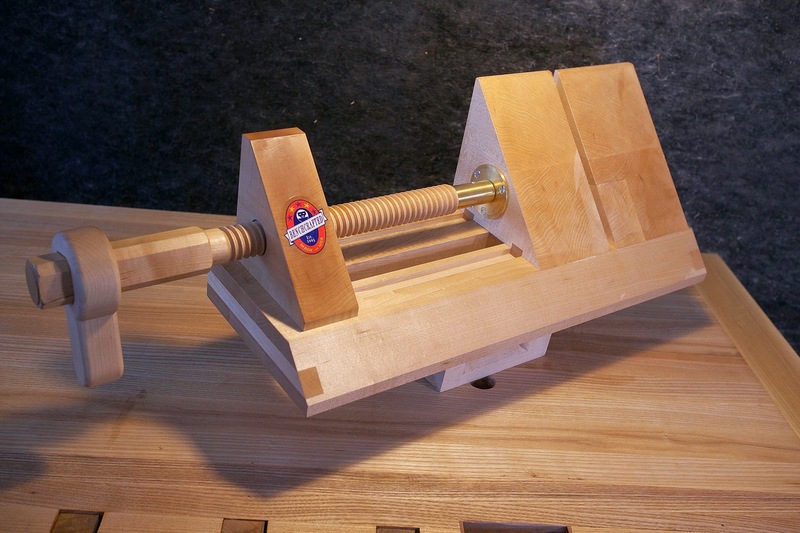 I installed two Lake Erie wood screws and fashioned a twin vise. I spaced the vise screws and the legs each at the same 1:6 ratio from the ends of the chop/top. The vise chop is chamfered in the middle to make clearance for use with hand saws. The shelf is made from poplar, and is shiplapped using tongue and groove joinery and beading. I used my previous workbench’s metal vise as a tail vise. I also bored 3 rows of dog holes, one to use for clamping in conjunction with the tail vise, a few holes 7 inches from the front for the holdfast, and the back row’s holes are to accept a work light. I used hand tools for mortise and tenon joints, shiplapped shelves, making the dowels, dog holes, and flattening the top. The lumber was dimensioned with power tools. The finish is two coats of 1:1:1 ratio of boiled linseed oil, spar varnish, and mineral spirits. I also put two coats of Tried & True Original (the one with beeswax) in addition on the threads of the screw and nut. I started and finished construction in 2014, but I had to wait until now for the weather to warm up enough to apply the finish in my unheated garage. Finally it is done after 1 year. If I built this again – I would skip the beading on the shelves. It looks nice – but collects dust. I would also replace the metal tail vise with a wagon wheel vise, now that I have experience with building/using a wooden vise. Thank you. Scott F.
Benchcrafted may have sold out of their La Forge Royale Miter Jack kits, but the good news is that they still have the metal bits portion of the kit available for sale for $38 on their website. (Link here to Benchrafted’s Blog on this topic).